It was not that long ago that I can remember myself despising the 90's style scrunchies but recently I can't get enough of them. The scrunchie has brought itself back into style and everyone is wearing them just like the nineties but even though its a born again fashion accessorie it is definiantly not loved by everyone with people still associating it with a must for Vicky Pollard! I recently bought two Topshop bunny ear styled scrunches' with different vintage inspired patterns on them. 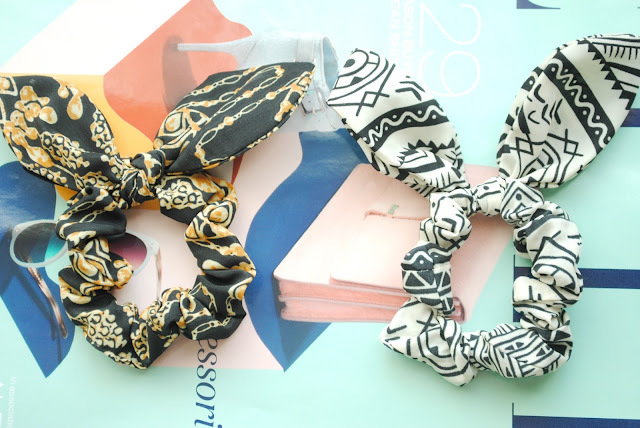 I love wearing these scrunchies with high ponytails and plaits, like most fashion items your going to either love it or hate it and this time round I definitely love this fashion trend. I think a scrunchie is the perfect way to up do your hair style if you don't want to put much effort or time into your locks. These scrunchies retail at £4.00 each which is pretty reasonable but I'm sure you can get cheaper online. OO I like that black&white one! Don't know if I've really fallen for this yet, but the ones above look cute!